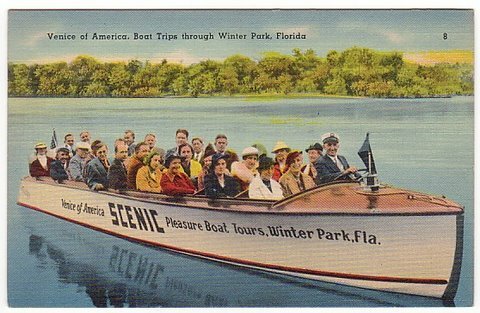 The Winter Park Scenic Boat Tour is a one hour trip you will enjoy whether it's your first time or hundredth time. The attraction began its operation in 1938 and is one of Florida's most interesting off-the-beaten-path experiences. What makes it unique is the route the tour boats take through Lakes Osceola, Virginia, and Maitland. Although its location in Winter Park is only ten minutes north of busy downtown Orlando, the tour route feels like a completely different world. You will see tropical trees and flowers along the route and some of the most spectacular mansions in the state. The Winter Park chain of lakes includes seven lakes, with the larger five being connected to each other by narrow canals. These canals were built by lumber interests in the late 19th century to float logs harvested from the surrounding forests to the sawmill locations. 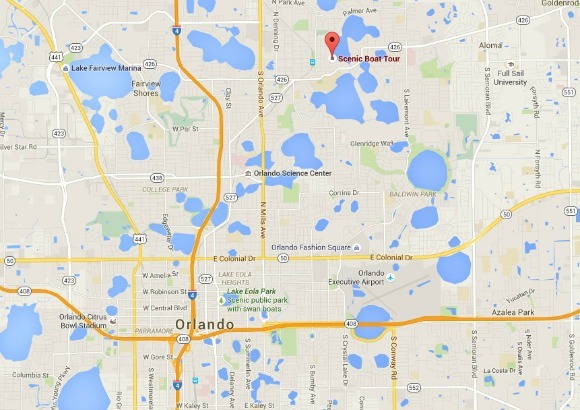 The boat tour begins at their headquarters in Winter Park at the end of Morse Boulevard on Lake Osceola. 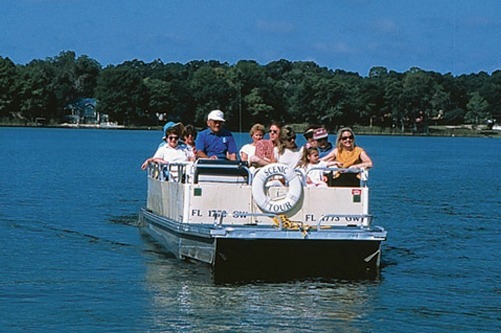 The tour is in one of six pontoon boats that each carry eighteen passengers and begins by showing you some famous structures in Winter Park history along the lake shore. 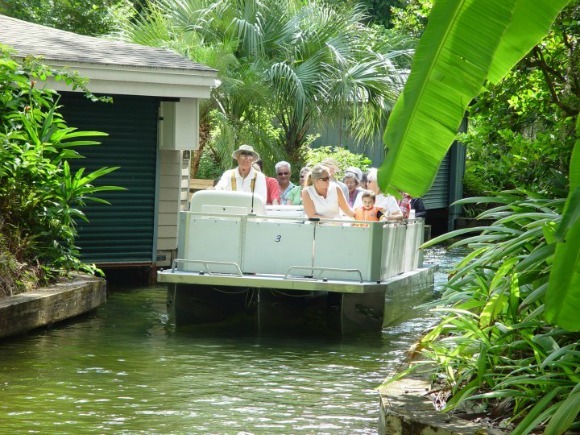 You will leave Lake Osceola and head south into Lake Virginia through a beautiful narrow canal canopied by ancient oaks, banana, cypress, and palm trees, ferns and just about anything else that grows in this part of Florida. The northern shore of Lake Virginia is home to the picturesque campus of Rollins College. 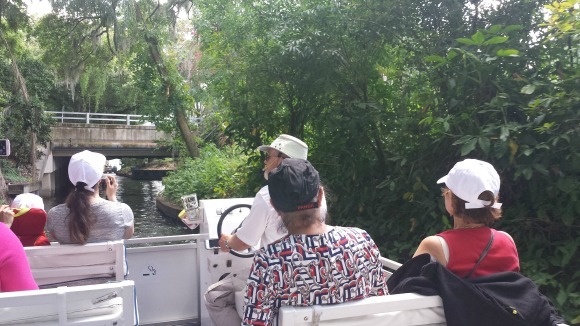 After touring Lake Virginia, the boat heads back north through the same canal and into Lake Osceola for a leisurely cruise along the shoreline and a glimpse into the many historic and modern mansions. Another beautiful winding canal takes you north into Lake Maitland where you will see Kraft Azalea Gardens and the spectacular homes on the Isle of Sicily, a man made peninsula that juts into the center of the lake. The tour guides are locals who know the area well and make the one hour cruise interesting. Many times nature cooperates in the tour by showing you large cranes hunting for fish or a gator swimming lazily along the shoreline. Tours leave every hour from 10 am to 400 pm; current admission fees (2016) are $14 for adults, $7 for children (ages 2 through 11) and kids under 2 ride free. The tour is open for business every day of the year except Christmas. More information at Winter Park Boat Tours.